My first sip of single-village mezcal didn’t come at an upscale bar, restaurant or spirits shop, as one might expect from a beverage that regularly finishes in the money at the International Review of Spirits competition. It came on a warm, clear afternoon in the village of Santa Catarina Minas in Oaxaca, Mexico, at Florencio Carlos Sarmiento’s courtyard dining table. I had just come from his mezcal distillery, where a pair of oak fermentation tanks held hundreds of pounds of pulped maguey, a plant more commonly known as agave. On either side of the tanks sat open farmland, with modest wooden shacks and stone homes dotting the distant hillsides. The rest of the distillery was similarly rustic: a thatched-roof hut, a wood-heated clay still, a stone slab and a huge rock-lined pit for roasting the maguey. It was a pastoral, almost mythical setting, and it epitomized the larger Oaxacan drink culture, where almost every elixir has a rich, ceremonial tradition stretching back centuries. Plus, it’s not every day you get to taste a local treasure while staring directly at its roots. Known as the “land of the seven moles,” Oaxaca City is a food and drink lover’s paradise. But outside the heart of the city lies Mexico’s second poorest state (behind Chiapas), where much of the population gets by on less than $5 a day. As a result, a visit to nearby markets and villages reveals a traditional lifestyle supplemented by few modern touches. Many meals and beverages are made by hand in a manner passed down through generations. Adding to the culinary mystique is the folklore surrounding the land and its people. In a region once ruled by Zapotec, Mixtec and other indigenous populations, and later invaded by the Aztecs and conquered by the Spanish—all with their own customs, superstitions and traditions— almost every plant has a long-established religious or cultural significance. In some cases, the beliefs may have faded or evolved over time, but rarely have they vanished. So when Oaxacans sip on local favorites like mezcal or hot chocolate, they’re often drinking from the same communal vessel as long-ago relatives. Not surprisingly, this adds a magical flavor to the brews, even for visitors. Mezcal’s history goes back generations, but the maguey plant itself was sacred long before the first drop of the distinctive spirit trickled through a still shortly after the Spanish arrived. Roasted and fermented maguey heart was an Aztec delicacy. Indigenous communities fermented the plant as early as 2,000 years ago to produce an undistilled beverage called pulque, which you can still find in some parts of the state. The name “Mexico” even translates as “those fed from the navel of the maguey” in ancient Aztec. Other crops share similar histories. Maize, or corn, Mexico’s most important staple, is the foundation for countless traditional Oaxacan recipes and is featured in several local beverages. Tejate, a thick blend of toasted corn, cacao, cinnamon, and the seeds and flowers of a fruit called mamey, is exalted by locals for its ceremonial, medicinal and aphrodisiac properties. A tejatera carefully toasts the ingredients the night before, then hand-blends them together the next day in a large ceramic bowl. She dips her arm in the mixture up to her elbow, then slowly and carefully folds it over and around until it reaches the proper consistency. Tejate may not be the most appetizing-looking beverage—it looks a little like dirty bathwater—but looks aren’t everything. Its full flavors (think protein shake) are lightened by the presence of the cacao and cinnamon, and it’s a favorite specialty of locals. Another drink dating back to pre-Hispanic times, hearty atole is served hot or cold and is traditionally made with cornmeal, water and a sweetener, such as brown sugar, molasses or vanilla bean. Locals might add aromatic flowers, fruit, honey, beans, chilies or tomatoes. The brew may or may not store the spirit of its maker within the foam, as legend dictates, but it definitely fills an empty stomach. Nearby at most markets, you’ll likely see another type of beverage stand—one with several large glass jugs, each holding a fruity, refreshing beverage. These festive-colored aguas frescas offer a quenching alternative to spicy local cuisine and scorching hot days, and they are so popular that Oaxaca City residents dedicate the fourth Friday of Lent to drinking them. Agua de jamaica, a juice of steeped hibiscus herbs, is particularly invigorating, as is horchata, an easygoing concoction with ground rice, cinnamon, sugar, small slices of lime or melon rind, and sometimes chopped almonds. Other popular fresca flavors include mango, pineapple, melon and lime. At the center of the region’s rich beverage culture is the cacao bean. 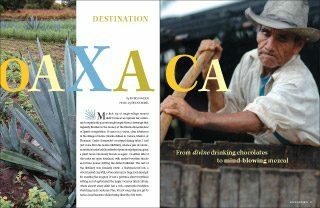 Hailed as the “food of the gods” in ancient times and once used as currency in Mexico, cacao pervades Oaxaca: in chocolate shops, where the sacred stuff is made on the spot; at food and beverage stands, which sell hot chocolate and champurrado—a chocolate atole that tastes like thick chocolate soup; in restaurants, which use chocolate in their distinctive moles; and in homes, where chocolate holds a special place as a ceremonial elixir. Oaxacans are said to consume about five times more chocolate per year than the average Mexican resident. Several of the streets and markets in Oaxaca City are dusty, crowded and sweet, with chocolate shops dotting the landscape. In the villages, artisan chocolate makers stick to the old methods of grinding cacao beans by hand on a stone tablet, but mechanized chocolate grinders dominate in the city. The cacao grinding process may be a trifle less romantic in a machine, but it hasn’t killed tradition—locals come to the shops with family recipes in hand and have employees grind the cacao beans, cinnamon, sugar and almonds to their specifications. It looks intriguing, too. A bit like a healer stirring a cauldron of precious herbs, the chocolate maker drops the beans and sweeteners into the hopper, then guides the syrupy chocolate paste through a sugar-filled chute and into a zinc tub. After first pass, he runs it through the grinder again to achieve a smoother consistency. The paste looks and smells intoxicating—a goopy, delightfully sloppy mess to thrill the Willy Wonka in all of us. Local markets like the Mercado 20 de Noviembre serve sweet, fulfilling hot chocolate with either milk or water. The Oaxacan version is peppier than expected thanks to the inclusion of vanilla, cinnamon and other spices, but it goes down smooth. When ordering one with water, watch as the maker twirls a hand-carved wooden beater called a molinillo between her hands to turn the chocolate and hot water into a frothy, airy blend. If chocolate is the heart of Oaxaca, mezcal is its soul. Almost every town has at least one distillery, and each village producer crafts a unique-tasting mezcal that differs according to altitude, microclimate, water, equipment and recipe. Some have fruity notes of citrus, pear, fig or mango; spicy textures with undercurrents of cinnamon or basil; or, most striking to the newly initiated, a smoky, earthy flavor that’s remarkably smooth. Mezcal is the ritual beverage of choice at most weddings, funerals, baptisms and confirmations. Faustino Garcia Vasquez, who runs a distillery in the village of Chichicapa, takes care to pour a touch of mezcal into the ground near his family’s shrine before offering a sample to visitors. The pour represents a hearty toast to his ancestors and his faith. n the crushing, where a burro or horse tows a massive stone wheel over the maguey, rendering it mush. Makers dump the crushed maguey in 300-gallon wooden vats, add about 10 percent water and leave the mash to ferment naturally in its own yeasts for just over a week. At this point, the flavors really start to develop, and the alcohol level skyrockets. After fermentation, the mixture is moved to a wood-heated clay still, which, over the next 24 hours, vaporizes and condenses the contents until a crystal-clear liquid is produced. Finally, the producers clean the fiber from the still and put the liquid through a second 24-hour distillation. Distill too quickly on either occasion, and producers say they’ll burn the mezcal flavor (and later the back of your throat). After almost a decade from seedling to cup, a batch of singlevillage mezcal is born. Then there are the high-volume industrial distilleries that produce most mezcal sold in Oaxaca City and the rest of Mexico. They typically ferment the maguey in huge stainless-steel tanks and add cane sugars, corn sugars and chemical yeasts to dilute the mix and speed up fermentation. Their product is cheaper and more accessible than the artisan mezcals, but the flavors are on par with the average tequila—tolerable when drowned in margarita mix, but not so hot when tasted straight. Most villagers disdain the stuff. That’s one reason sitting down at Florencio Carlos Sarmiento’s table to taste his Minero mezcal was so eye-opening. He’s been producing mezcal in roughly the same manner for 52 years, and until the past decade, it was made exclusively for family and neighbors. Now, as his brew is gaining a wider audience, he still adheres to the same methods, reasoning that a good mezcal comes from the head and the heart, not the stopwatch. The spectacular flavors of these artisan mezcals are gradually earning recognition beyond the borders of Oaxaca and Mexico, even in parts of the U.S. Much of the credit goes to people like Ron Cooper, an artist and sculptor who poked around Oaxaca in 1990 looking for the area’s finest liquor to christen a new sculpture. Local farmers pointed him toward remote mountains, faraway valleys and the ends of rural dirt roads. Tasting a few of those hard-won samples led to a more significant discovery: The best ones tasted nothing like the mezcal available in Oaxaca City, and most of the city’s residents—and international consumers— had no idea this stuff existed. Five years and an export license later, he opened Del Maguey, which imports some of the best village mezcals to the U.S.
Now Cooper takes the villagers’ mezcals to tastings at fine U.S. restaurants, liquor contests and anywhere else chefs and aficionados gather to admire a spirit’s flavor, nose and finish. And it’s paid off. Del Maguey regularly walks off with the title of best mezcal at the International Review of Spirits Championship. The notoriety has also paid off for Ron’s partners in the villages, who have bought better equipment, built better homes and acquired more land with the proceeds from Del Maguey sales. Best of all for enthusiasts, Oaxaca City is no longer the hardest place in the area to find a good, lovingly brewed mezcal. For a taste in the city, check out La Cava, which sells artisan mezcals, Mexican wines and fine cigars, offers tastings and advises on food pairings. La Cava is run by the Los Danzantes distillery, which produces its own line of mezcals—following the traditional single-village methods—in a beautifully restored facility in Santiago Matatlán. As further proof of the endurance of authentic mezcals, Los Danzantes also runs one of Oaxaca City’s hippest restaurants, Restaurant Los Danzantes, where good mezcal runneth over both straight and in mixed drinks and where I savored my last sips of local spirits. Less than 12 hours after sitting down at Carlos Vasquez’s table to taste his generations- old Minero, I imbibed a house mezcal at Restaurant Los Danzantes. In comparison, both spirits tasted sweet, lively and refreshingly complex. Both generated a warmth that hovered in my chest and behind my eyes. And while gazing at the modern reflecting pools and mosaic sculptures decorating the eatery, I could visualize and taste a heritage that’s endured for more than four centuries. And that made for a most flavorful experience indeed. 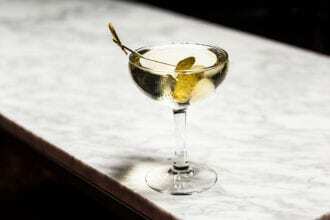 Fino sherry elevates a classic.